The Pool in Central Park is located at 102nd street and Central Park West. Don’t get confused with an actual swimming pool because there is one of those about a 10 minute walk north. This pool is a small pond ideal for picnics, short running loop, both people and bird watching and fishing. One of my favorite locations in Central Park, I visit The Pool multiple times a week. It has a nice calming presence in a city otherwise dedicated to a 24 hour grind. During the Summer, The Pool is great to visit after work because the sun doesn’t set until 8pm. You can take the B or D trains uptown to the 103 St stop, exit and you are right there. 1. Arrive around 6-6:30pm and walk over to the Whole Foods on 98th street and Columbus Avenue and pick up some food and then head back to the park to eat. The great thing about this area is you watch the sunset and then the lights within the city start to come up all around you. A kind of goodbye to the day and welcome to the NYC night. 2. People, Bird and Raccoon Watching. I saw a Double-Crested Cormorant the other day and in the evenings a Great Egret comes in to fish. Both are really cool birds to observe. There is also a family of raccoons who live in the large willow tree overhanging the pond. Towards dusk they start getting loud and you will see them walking around on the back edge of the pond that is fenced off to the public. 3. 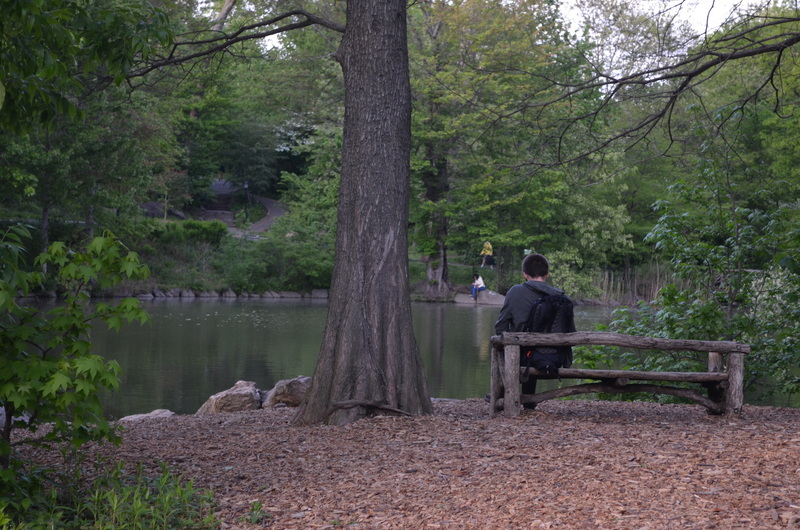 Fishing – The Pool is one of three designated fishing locations within Central Park. The other two are The Meer in Harlem and The Lake further south. You will typically find large mouth bass, bluegill, crappie and catfish in the pond. All fishing is catch and release with barbless hooks and a New York State fishing license is required. The license is $25 annually for residents. 4. During the Summer outdoor plays are performed around the lake. Admission is free and you will be required to follow the actors as they use the whole area as their stage; it is great. In such a busy and hectic city, your article brings calm and a place to go to unwind from the day. Great photos too! Next time you are in the city I will give you a tour!